Artist Tyler Nordgren, widely known for his classic images of the night sky and other wondrous landscapes, has generously created 100 limited edition, signed and uniquely numbered posters for 2017 International Dark Sky Week. This poster is the first in what we expect will be a series of annual prints that are almost certain become a collector item. Each signed and numbered print is being sold for $100 (shipping included) and can only be purchased through International Dark Sky Week, ending April 28, 2017. By purchasing this limited edition 2017 International Dark Sky Week poster, not only will you acquire Tyler’s art, but your purchase will go to support the important mission and program work of IDA to reduce light pollution and its environmental impacts. To purchase, please contact Susan by phone at (520) 347-6360 or susan@52.10.225.191. Unsigned prints can be purchased at our IDA Shop, here. Dr. Tyler Nordgren is a well-known artist, astronomer and night sky ambassador who has helped document this vanishing landscape with award-winning night sky photography that has been on display in galleries from New York City to Flagstaff, Arizona. 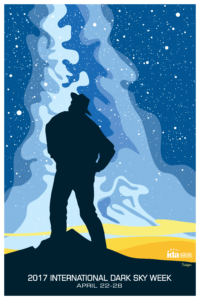 Dr. Nordgren has also developed a campaign in conjunction with the National Park Service: “Half the park is after dark.” Learn more about Tyler Nordgren and see more of his work at http://www.tylernordgren.com/.